Developed from the turbine-powered SA 360 Dauphin, Aerospatiale's SA 365 introduced twin-turbines and became named Dauphin 2 to indicate this. Aerospatiale flew the prototype (F-WVKE) of the SA 365 Dauphin on 24 January 1975. Certificated by the French Government for VFR, the Dauphin 2 should carry 3,478 pounds of payload at a cruise speed of 143 knots. Flown on 24 January 1975, the first SA 365C was powered by two 492-kW (660-shp) Turbormeca Arriel engines. From the SA.365C model, the AS.365N variant was developed; it looked similar to its predecessor but in fact had 90 per cent new or improved parts. Modifications included extensive use of composite materials for the structure, rotor blades with a different profile, a modified fuselage and a retractable tricycle landing gear. The SA.366G version was developed at the same time as the AS.365N. Designed in response to an order from the US Coast Guard, it differed primarily in using 590 hp (440-kW) American Avco Lycoming LTS-101 engines. An SA 366 Dauphin prototype first flew on 28 January 1975. For the search and rescue missions for which it is intended, the aircraft has sophisticated avionics equipment by Collins. It has two sliding doors, a rescue hoist and can take three stretchers and four assistants. One of the first civil models set a world speed record on 9 February 1980 by flying non-stop from Paris (heliport) to London at an average of over 294km/h, beating this two days later by a direct flight from Paris (Issy-les-Moulineaux) to London at 321.9km/h. In 1979 the US Coast Guard ordered 90 SA365G-1s (HH-65A Dolphin) for short range recovery tasks which, though not requiring offensive capabilities means the aircraft must have the latest maritime search and surveillance equipment. These all feature the retractable undercarriage and other new features that distinguish the Dauphin IIN from the original SA 365 Dauphin II. The HH-65 is based on the Eurocopter Dauphin (AS 365N) but despite its origins in the French-made Aerospatiale/Eurocopter system, the HH-65 Dolphin is produced in the United States by American Eurocopter, Textron Lycoming (turboshaft engines) and Rockwell Collins (electronics). First flight was achieved in 1980 and the system was introduce in whole by 1985. In service in the USCG with some 102 total Dolphins making up the Coast Guard HH-65 force. The HH-65 design in characterized by her low-set forward cockpit showcasing a smallish pointed nose assembly and a shrouded Fenestron tail section. The undercarriage is fully retractable and is made up of two single-wheeled main landing gears and a double-wheeled nose gear. Engines are mounted hit and above the crew cabin about midway on the design. The body integrates smoothly into a finely contoured empennage that fits a single vertical tail fin (above the Fenestron shroud) and a horizontal tailpane situated. Power is derived from twin Turbomeca Arriel 2C2-CG turboshaft engines delivering up to 934 shaft horsepower and driving a corrosion-resistant composite four-bladed main rotor. Maximum speed tops 184 miles per hour with a range of 409 miles and a service ceiling of 15,000 feet. The Dolphin sports an empty weight of approximately 6,333lbs and a maximum take-off weight of up to 9,480lbs. Like the main rotor blades, the fuselage and rotor head are both constructed of corrosion-resistant materials for operations over the salty ocean. In fact, this type of composite construction makes up some 75% of the helicopter design. Crew accommodations onboard a typical HH-65 model include the pilot, co-pilot, flight mechanic/flight engineer and rescue swimmer. Visibility is rated an excellent thanks to heavy use of glazing in the forward, side and top portions of the cockpit. The flight mechanic is afforded a chair which can slide on rails from one cabin side to the other as needed. The original Dolphin paint design featured a red, white and black scheme but this has since been changed to an overall red (still maintaining the black nose and exhaust sections) for easy visual marking from icebreaker vessels. The change in color has also cut off three days to the overhaul time needed for the aircraft. The Dolphin maintains a distinct operating capability that allows its autopilot system to bring the aircraft to a hover or fly a designated flight pattern without the need for pilot intervention. This obviously frees up the pilots to other mission matters, particularly when having to visibly scan the surface of the ocean for persons or vessels. Deployment for Dolphins usually originates at land bases but Coast Guard Cutters are designed to take on the type. The HH-65 has since been spawned into four major versions. The initial production model entered service in 1985 as the HH-65A, fitting twin LTS101-750B-2 series turboshaft engines of 735 shaft horsepower each. This was followed in 2001 by the upgraded HH-65B model with its revised avionics suite, twin global positioning integrated systems and two cockpit-mounted multi-function flat displays. If there was a drawback to the Dolphin system up to now, it lay in her Lycoming-brand engines, forcing the USCG to look through other powerplant options available. The HH-65C's were essentially A and B production models fitted with twin the French-made Turbomeca Arriel 2C2-CG turboshaft engines of 934 shaft horsepower each. These powerplants were already proven components of the Eurocopter EC155 series and marked an improvement in both efficiency and reliability over the original set of American-made Lycoming (Honeywell) LTS101-750B-2 turboshafts. Other changes to this model included new gearboxes for main rotor and tail, an 11-blade Fenestron tail rotor, an increase to its MTOW (Maximum Take-Off Weight) and a lengthened nose of new equipment. The first post-conversion C-models were made available in late 2004. A- and B-model Dolphins were retrofitted with the new Turbomeca Arriel 2C2-CG turboshafts and brought up to C-model standard, taking on the designation of HH-65C as well. The MH-65C is a derivative of the HH-61C with an improved transmission, digital autopilot, revised avionics, increase fuel capacity, increased MTOW and a new 10-bladed tail rotor featuring noise reduction. The MH-65C has been used by the US Coast Guard's Helicopter Interdiction Tactical Squadron (HITRON) "Force from Above" armed helicopters. Based out of Jacksonville and operating with the Department of Homeland Security, these Dolphins are armed aircraft charged with conducting "Airborne Use of Force" sorties in high drug trafficking areas as well as to counter general security threats in American waters. To compliment this new-found role, the MH-65C's utilized by HITRON field a 7.62mm M240B general purpose machine gun and a 12.7mm Barrett M107CQ anti-materiel rifle. HITRON Dolphins are also used to guide their accompanying "Over The Horizon Cutter Boats" (OTHCB) to the scene of a given crime for possible interception and/or apprehension. MH-65C "HITRON" Dolphins began operations in 2008. 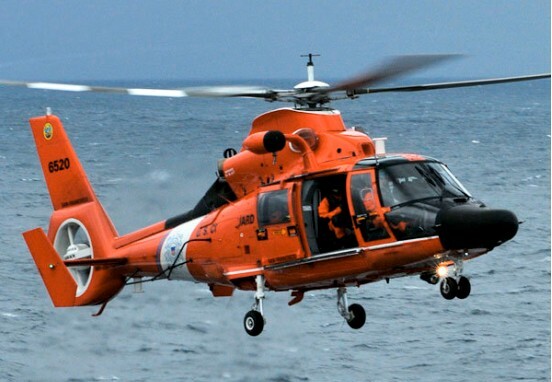 The HH-65 Dolphin replaced the Sikorsky HH-52A Sea Guards then in service with the United States Coast Guard (USCG). Israel purchased two HH-65s, and in trials operated them from the navy's fleet of fast patrol craft, plus two HH-65s were used by the US Navy test centre at Patuxent River, Maryland. Powered by two Avco Lycoming LTS101 engines of 507 kW (680 shp) one was a prototype; two of the first five production aircraft were SA 365Gs, one of which was been flying in France with a production-standard 680 shp Avco-Lycoming LTS101-750AA turboshafts while the other was at the Aerospatiale Helicopter Corp, Grand Prairie, Texas, facility for installation and flight testing of the Rockwell-Collins avionics. An even bigger contract gained in 1980 by France, was the vast 'Sawari' order for military equipment for Saudi Arabia. Part of this comprised 24 SA 365F Dauphin 2 maritime versions, the final 20 being equipped with four AS.15TT anti-ship missiles. This anti-ship Dauphin, which is intended to compete with the already existing Lynx with Sea Skua missiles, was developed with Saudi funds and has a Thornson-CSI` Agrion radar which provides guidance for the AS.15TT, which itself was financed by this contract. The SA 365K differs considerably by being almost 75 per cent of composite construction, such as Kevlar, Nomex and carbonfibre. A Dauphin AS 365X set a speed record in March 1991 flying a 3km course. These earlier versions were superseded by the standard civilian variant, the SA 365N Dauphin 2 first flying in March 1979, and first seen at the 1979 Paris Air Show and its derivatives, which have a new structure making extensive use of composite materials such as glassfibre, Nomex, Kevlar and Rohacell, and with carbon-fibre composite in the spars of the rotor blades. The SA 365N also features fully retractable tricycle landing gear, and is one of the fastest of all helicopters, having set many world point-to-point speed records including Paris-London in 63 minutes at an average of just over 322 kph (200 mph). The standard AS 365N can accommodate up to 13 passengers. Powerplants are two Turbomecca Arriel 1C1 turboshafts, each rated at 724 shp (540 kW). A naval variant, designated AS 565F, was in production in 1990. Arriel powered military versions of the Dauphin include the AS.15TT-equipped SA.365F for the Saudi Navy, with either an Omera ORB-32 of Thomson-CSF Agrion radar, and the similar but unarmed SA.365F for the Irish Air Corps, fitted with Bendix RDR-L500 search radar and a Crouzet ONS-200A long-range navigation system. A military development of the Dauphin is the multirole SA.365M Panther. A production standard Panther was demonstrated in April 1986, and was planned to be available for delivery in 1988, followed in 1992 by a further-refined version with full day and night combat capability. The SA.365M has a Turbomeca TM333-1M powerplant, and is based on the standard SA.365N airframe, but makes extensive use of composite materials, in addition to having military features such as armoured crew seats, self-sealing fuel tanks, and cable cutters. Engine exhausts are designed for reduced infrared signature, and armament options include 20mm gun pods, rocket pods, Matra Mistral AAMs, and HOT anti-tank missiles with an associated Viviane roof-mounted sight. In the assault transport role eight to ten troops may be carried. French certification (VFR, day and night, category A and B) was awarded to the Aerospatiale SA 365N Dauphin IIN on 9 April 1981. The AS.365N3 with wide 12-passenger fuselage, five-blade main rotor and improved avionics suite, first flew in prototype form on 16 June 1997. It was later redesignated EC-155. The Harbin Z-9 (Chinese name: Zhishengji-9 / Vertical take-off aircraft 9) are licence-built AS 365N Dauphin 2. A licence agreement (Aerospatiale/CATIC) was signed on 2 July 1980 and the first (French-built) example made the initial acceptance flight in China on 6 February 1982. Chinese parts manufacture began in 1986 for the initial agreed batch of 50, the last of which was delivered in January 1992. The transmission was manufactured by Dongan Engine Manufacturing Company at Harbin, and hubs and tail rotor blades by Baoding Propeller Factory. Production continued under a May 1988 domestic contract. Plans to introduce the Arriel 2C were announced in mid-2001, following delivery of two of these engines in April. The first flight was achieved in September 2001. A total of 110 (all versions) were reportedly built by mid-2001 and eight H410As were ordered mid-2002 by Far Eastern Leasing Company, China State Oceanic Administration and Zhoushan Civil Aviation Development Company. Most early production was for Chinese armed services (People's Navy Aviation and Army Aviation each at least 25) and People's Armed Police (four delivered 12 September 2001). The type entered service with two PLA army groups in January and February 1988 (Beijing and Shenyang Military Regions respectively). The People's Navy Aviation was believed to use Z-9A for commando transport as well as shipboard communications. Ten were based at the former Royal Air Force airfield at Sek Kong in the third quarter of 1997, following the 1 July handover of Hong Kong by UK. The first export was made in late 2000 (two to Mali Air Force). Civil models were used for various duties including offshore oil rig support and air ambulance (four stretchers/two seats or two stretchers/five seats). In 1992, Flying Dragon Aviation received two (late production Z-9s, augmenting an Aerospatiale Dauphin) which are operated on behalf of the Ministry of Forestry. Five civil Z-9s ordered by Shenzhen Financial Leasing Company (SFLC) in 2001. One Z-9A was deployed to Arctic regions in mid-1999, on a scientific survey ship. 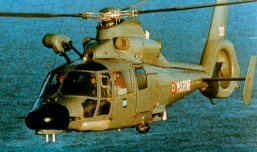 Commercial and military sales of the AS 365 Dauphin 2 exceeded 500 aircraft for operators in some 44 countries by 1990. The total also includes licence production in China as the Harbin Z-9/Z9A, an initial batch of 50 having been due for completion in 1989. The multi-role SA 565UA Panther is a military development of the twin-engined SA 365 Dauphin first flown on 29 February 1984. Based on the standard SA.365N1 airframe, the primary changes include more composite materials and armoured crew seats to maximize survivability in combat zones, the introduction of Turbomeca TM333-1M turboshafts with a continuous rating of 751shp, and the provision of equipment to permit the use of armament and to allow for night operations. Fuselage-mounted outriggers can carry air-to-ground weapons such as rocket or gun pods and/or air-to-air Matra Mistral missiles. For the assault role, up to ten troops can be carried, or external freight up to 3,515 lb (1 600 kg). First customer was the Brazilian Army, which had ordered 42. 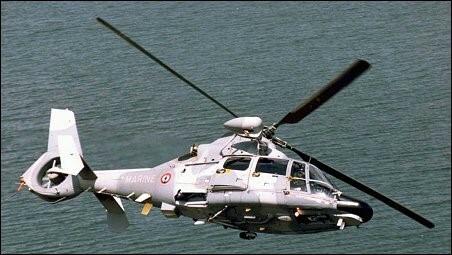 The SA575-SA is a navalised derivative of the Panther light military helicopter, itself a derivative of the Dauphin. The AA version can be equipped with pod mounted cannon etc, the MA is a SAR version, and the SA is armed for anti-ship or ASW. Chile operates four AS 565 MAs fitted with radar warning and Exocet missiles and Saudi Arabia uses AS 565s equipped with the AS.15TT short-range anti-ship missile. SA.360 fitted with two 650shp Turbomeca Arriel 1A turboshafts Prot. F-WVKE FF 24 Jan. 1975. Second prot. F-WVKD used for testing retractable u/c. Civil production version of SA.365 with 3382kg TOGW. SA.365C with 667shp Arriel 1A1 turboshafts. SA.365C with 670shp Arriel 1A2 turboshafts, 3480kg TOGW and modified transmission system. SA.365C with retractable tricycle u/c, lengthened cabin with max 11 pax separated from crew, pointed nose, composite rotors new air intakes and redesigned under-floor fuel tanks. 710shp Turbomeca Arriel IC turboshaft, 3977kg TOGW. FF 31 Mar. 1979. Prot. F-WZJD. SA.365 with 724shp Arriel 1C1 turboshafts, 4076kg TOGW and recontoured lower tail section eliminating ventral fin. SA-365N with two 763shp Turbomeca Arriel 1C2 turboshafts, new gearbox, 4226kg TOGW. AS.365N with quiet tail rotor and two Arriel 2C turboshafts. Prot. FF Oct. 1996. AS.365N3 with wide 12-passenger fuselage, five-blade main rotor and improved avionics suite. Prot. FF 16 Jun. 1997. Redesignated EC-155. Navalised SA.365N for Saudi Arabia etc. With pointed radar nose and either under-nose radar dish or antisubmarine missile system and 700shp Arriel 1M turboshafts. Prot. F-WZJD FF in this form 22 Feb. 1982. Army light tactical version of SA.365N1 with 12-troop capacity. Powered by two 913shp Turbomeca TM.333-1M turboshafts. 4077kg TOGW. Prot. F-WZJV FF 29 Feb. 1984. Later named Panther. Initial Chinese version, equivalent to French AS 365N1 and assembled from French-built kits: 28 completed. Follow-on kit-built version, to AS 365N2 standard. Final 22 of first 50 were of this version. Effectively, prototypes for domestic licence-built version, with WZ8A engines and much increased local manufacture (72.2% of airframe and 91% of engine). Two built; first flight 16 January 1992; flight test programme completed 20 November 1992 after almost 200 flight hours (408 flights); Chinese type approval received 30 December 1992. First indigenous production version, based on Z-9A-100. Modified Fenestron with 11 wider-chord, all-composites blades instead of 13 metal blades as in AS 365N1. Principal unarmed PLA version for SAR, artillery direction, EW, troop transport (accommodates eight), communications and other utility duties. Certified also for domestic commercial operations 19 April 2001. Version for PLA Naval Air Force, for deployment aboard certain classes of destroyers and frigates; in service by late 2000. Believed to be equivalent to Arriel 2-engined Eurocopter AS 565 Panther, but equipped with Thales HS-12 dipping sonar and KLC-11/J-band (Chinese version of Agrion 15) surface search radar; armament includes two Yu-7 torpedoes or TV-guided C-701 anti-surface vessel missiles. Armed (wuzliuang) version (also reported as Z-9W); eight Norinco HJ-8 (Hongjian: Red Arrow) wire-guided anti-tank missiles, twin 12.7mm machine gun or 23mm cannon pods, or twin 57 or 90mm rocket pods, and gyro stabilised, roof-mounted optical sight. First flight thought to have been in early 1989; in production. Export designation Z-9G, available with or without roof-mounted sight. Version with 635kW Arriel 2C (WZ8C) turboshafts for improved 'hot-and-high' performance. (Designation signifies 4.10 tonne MTOW.) First flight September 2001; CAAC certification 10 July 2002. Initial orders for eight. VIP version of H410A (thus 4.25 tonne MTOW); improvements to rotor system, fuel system and structure (crashworthiness), avionics and interior layout. SA.365M with 748shp Arriel 1M1 turboshafts. Redesignated AS.565. SA.365N with combined composite rotor hub/mast, 5-blade rotor with swept tips, and 837shp Turbomeca Arriel IX turboshafts. Three-seat SA.365N for US Coast Guard short-range recovery tasks with internal stretcher fittings, rescue hoist, pop-out flotation bags etc. 4027kg TOGW. Powered by two 680shp Textron-Lycoming LTS.101-750A-1 turboshafts. Prot. USCG.4101 FF 23 Jul. 1980. Four built. Production AS.366G with LTS.101-750B-2 turboshafts and 4036kg TOGW. 92 built. Armament: four Aerospatiale AS.15TT radar-guided missiles.